The story of what happens to an unlucky young lover when the stars align against him on Valentine’s Day. 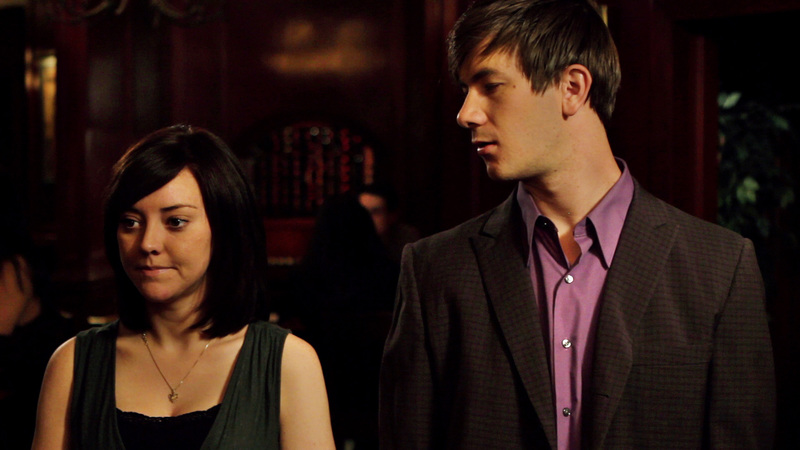 Wes (Travis Lincoln Cox), a young, smart, but unlucky twenty-something, needs this Valentine’s Day to go right. His relationship with his girlfriend, Angela (Whitney Morgan Cox) has been falling apart, but he’s hoping tonight will put it back together. That doesn’t seem to be in the cards though –Wes is breaking out in a rash, the dinner reservation gets lost, and finally, Wes and Angela are seated next to love’s most outspoken (and rather drunk) critic (Timothy Carr). As the weaknesses of their relationship are unknowingly narrated by the crotchety stranger, both Wes and Angela get the feeling that this night together might be their last. Travis Lincoln Cox – Wes. 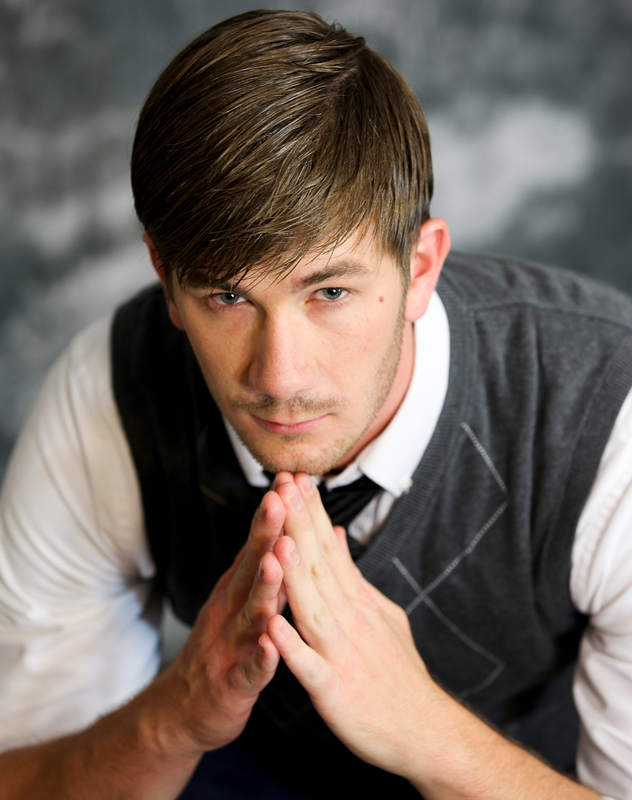 Travis Lincoln Cox is an actor, writer, and lover of life. He is always trying to keep himself busy whether with plays, films, music, writing, or just having fun. Travis is theatrically trained and has been nominated for the Irene Ryan award two times for his work in 110 IN THE SHADE and AS YOU LIKE IT. Travis can be seen in the Disney filmJOHN CARTER and has a leading role in the web series MILD MANNERED. He is always an advocate of being happy, and doing what you love. Whitney Morgan Cox – Angela. Whitney Morgan Cox is an accomplished actor who has received the National Irene Ryan Award and was named one of the top sixteen collegiate actors by the Kennedy Center. Whitney’s background in theatre and dance has placed her in performances ranging from MACBETH to SWEENEY TODD to THE NUTCRACKER. She can be seen in the Disney filmJOHN CARTER and has a leading role in the web series MILD MANNERED. Timothy Carr – Bill. 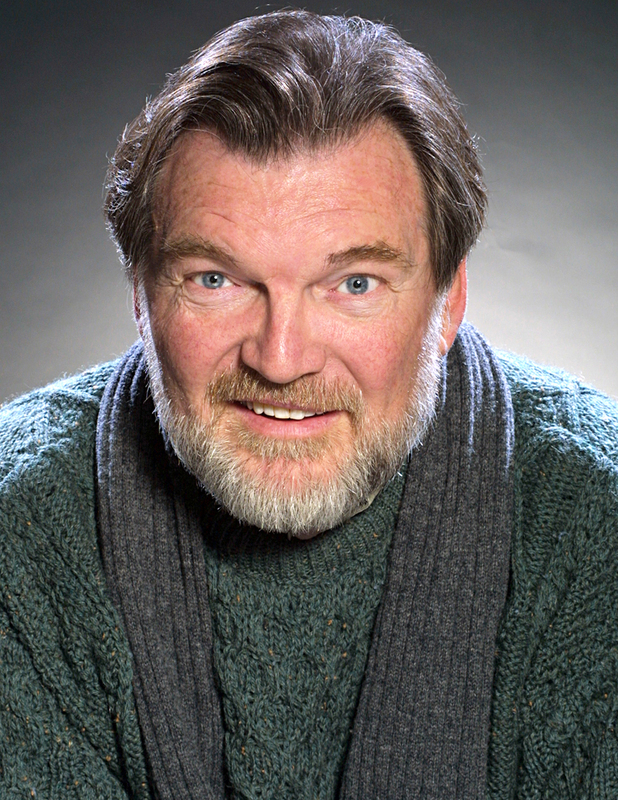 Since his arrival to San Diego from Chicago in 2000, Timothy Carr has had the opportunity to work with numerous independent and community theaters throughout San Diego. One of his favorite stage roles was the Bailiff in Sledgehammer Theatre’s acclaimed THE TRIAL OF GEO. W. BUSH in 2006. Timothy has also worked with independent filmmakers in San Diego and Los Angeles and has contributed his skills to student film projects at SDSU, UCSD, Chapman Univ. and AFI. Chuck McCarthy – Jay. Originally from Atlanta, Georgia, Chuck McCarthy now lives in Hollywood, where he does his fair share of Hollywood Acting. Beyond acting, he enjoys a certain amount of notoriety as a blogger and Internet neerdowell. Distrusting intimacy has become second nature for Chuck, so it is little wonder that he was chosen and is happy to bring the character Jay to life. Love is only meant to bring us pain, as those who have loved can tell you… love does not last and only pain remains. Chuck thinks he made that last bit up, but there is no telling. The same thing has probably been said a million times, in a million different ways, by a million different hopeless romantics. EP McKinght – Cindy. 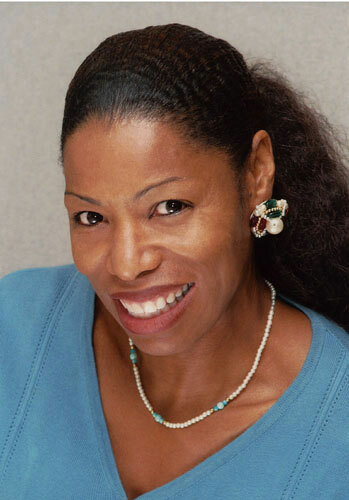 EP McKnight (SAG, AEA, AFTRA) is a poet, actress, and writer. Her Los Angeles theatre credits include AS IT IS IN HEAVEN, CRANE MISSISSIPPI, EXILES FROM PARADISE, LEO’S BARBERSHOP & GRILL, SPINNELI, SECRETS OF THE PUSSYCAT. New York theatre credits include FENCES, THE CRUCIBLE, DO LORD REMEMBER ME, BLACK GIRL, MY DIARY, and A RAISIN IN THE SUN. Television credits include ER, ONCE & AGAIN, UNSOLVED MYSTERIES, DHARMA & GREGG, LAW & ORDER, ONE LIFE TO LIVE, ALL MY CHILDREN, ANOTHER WORLD, and several commercials. Film credits include HAZING, RAT RACE, PRINCESS DIARIES, SHAKEDOWN COP, JUNGLE FEVER, and QUICK CHANGE. Writing credits include I QUESTION AMERICA, a play about Fannie Lou Hamer, and CATCH THE SPIRIT, a play about Bessie Coleman. Annaniah Jones – Hostess. 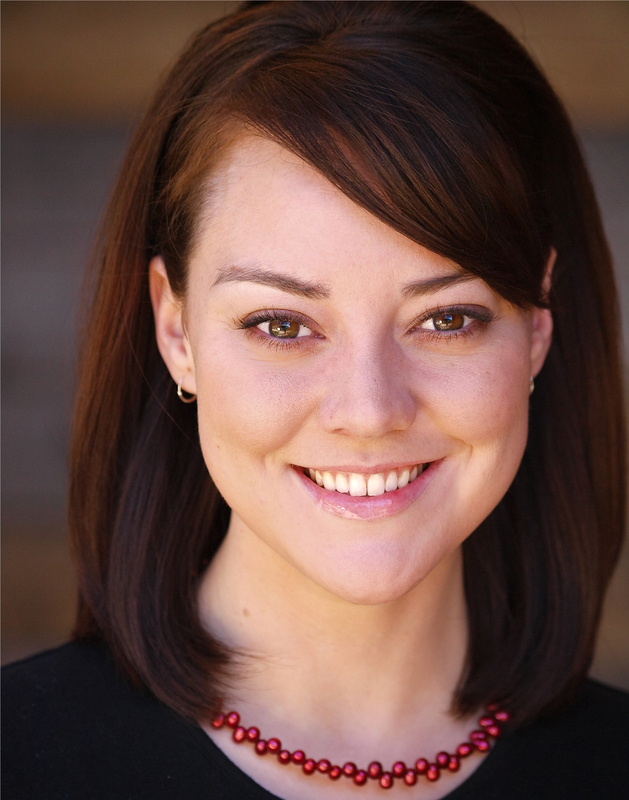 Annaiah Jones is an actress with credits in many television shows, including TERRIERS, and has appeared in 6 films. She has also modeled commercially for Coca-Cola and Crest Toothpaste and has appeared in national and local television commercials. SAINT VALENTINE is a collaboration between husband and wife, Stephen and Melanie Crutchfied (director and writer, respectively). Melanie wrote the script after she heard a radio story on toxoplasmosis. She likened the intoxicating effects toxoplasmosis has on rats to the foolhardy thoughts of a person in love. This belief manifests itself in the character Bill, a harsh critic of love who nearly ruins Wes’s evening. Even though Bill is an old curmudgeon, he may have a point. After 12 years of marriage, Melanie and Stephen have come to learn that love is not always easy. The Crutchfields cast another married couple (Travis Lincoln Cox and Whitney Morgan Cox) in the leading roles of Wes and Angela. Their natural chemistry brought the characters to life. The Crutchfields hope that SAINT VALENTINE inspires the viewer to believe that love is worth the risk. Writer Melanie Crutchfield was inspired to write the script after she heard this Radiolab show that talked about toxoplasmosis. The first draft revolved around the drunk but charming Bill, who shared his thoughts on love with strangers at a bar on Valentine’s Day. Travis Lincoln Cox got in a motorcycle accident the day before production. Cox’s tooth punctured his skin below his lip. The puncture can be seen throughout the film and is played off the first time we see him as a razor cut. 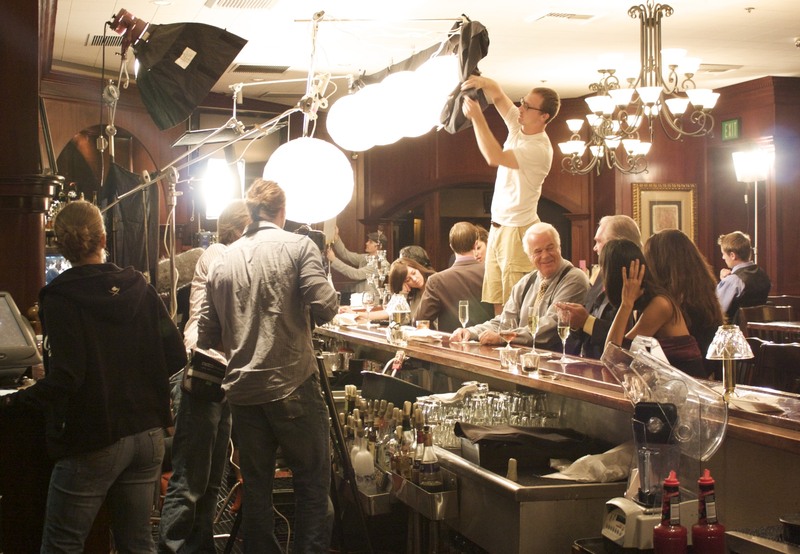 The restaurant scenes were shot at Donovan’s Steakhouse in La Jolla, CA over four days from 10:00am to 3:15pm. Being poor film students, that was the only time the restaurant allowed the crew to shoot on the shoestring budget that they had (THANK YOU DONOVAN’S!). Martini hour started at 4:00pm. It’s highly recommend, if you’re not a poor film student. Four of the six main actors were cast through video auditions. Director Stephen Crutchfield never met them in person until rehearsals. 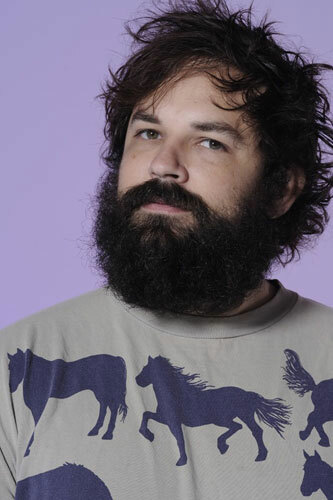 Due to Chuck’s web presence – IdeasbyChuck.com, chuckmccarthy.com – and because he fit the role of Jay so naturally, Melanie and Stephen considered having Chuck play himself. The jazzy original score was written, recorded, and mixed in 3 days by Chris Truitt and friends in Bakersfield, CA. A Kathleen Kennedy Production Grant made this film possible. The crew makes some adjustments. 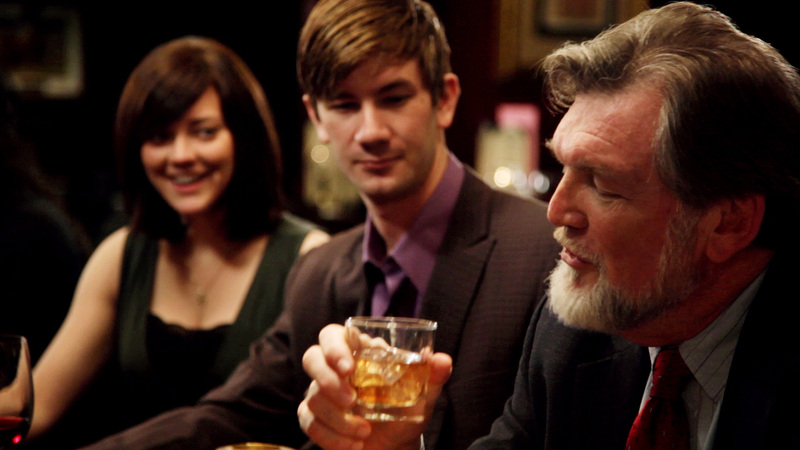 Director Stephen Crutchfield discusses a scene with Timothy Carr, Travis Lincoln Cox, and Whitney Morgan Cox. Crutchfield rehearses a scene with Annaish Jones, Whitney Morgan Cox, and Travis Lincoln Cox. Wes (Travis Lincoln Cox) gets the feeling that this may be his last night with Angela (Whitney Morgan Cox).